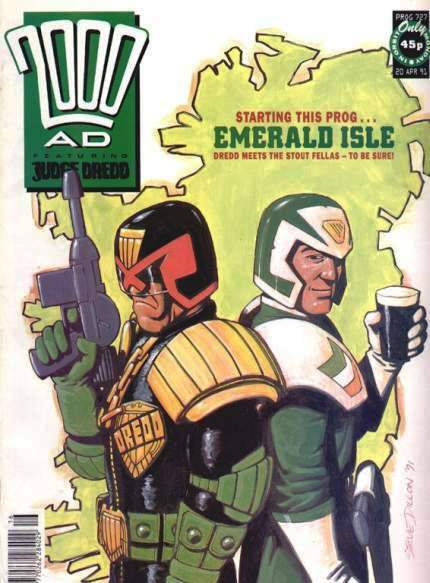 This goofy character is a Judge from the post-nuclear, futuristic theme park remnants of Ireland in the Judge Dredd setting. 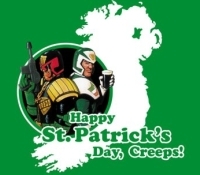 Posting a themed St Patricks Day figure is about as close as I get to jingoistic flag waving. Thankfully the Emerald Isle concept and story which developed the concept couldnt really be described as “reverential”. 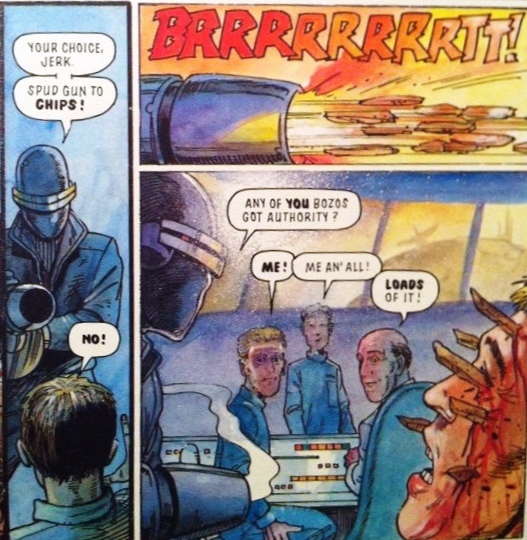 Those sensitive about geographical stereotypes should probably avoid the Dredd comics in some respects: most regions are depicted in a grossly exaggerated style, with a thick layer of futuristic dystopia added to taste. 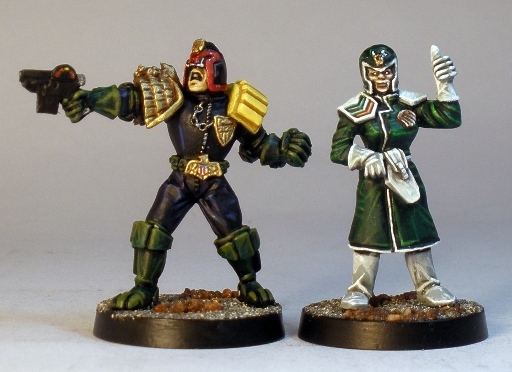 I have painted a lot of models over the last couple of years that can be used in the rather broad Judge Dredd setting, but as February 2012 was the last time that I painted/posted any models with direct links to the Dredd stories I decided to work on this model for St Patricks Day, just for fun. The model isnt a very inspiring sculpt, however there is no denying the models appropriately gaudy, plastic shamrock style Oirishness, so its apt for this weekends international celebration of… something… booze mainly. The miniature came out very nicely. Subtle green combined with the white really makes for a good scheme. The face really stands out and brings the miniature to life. 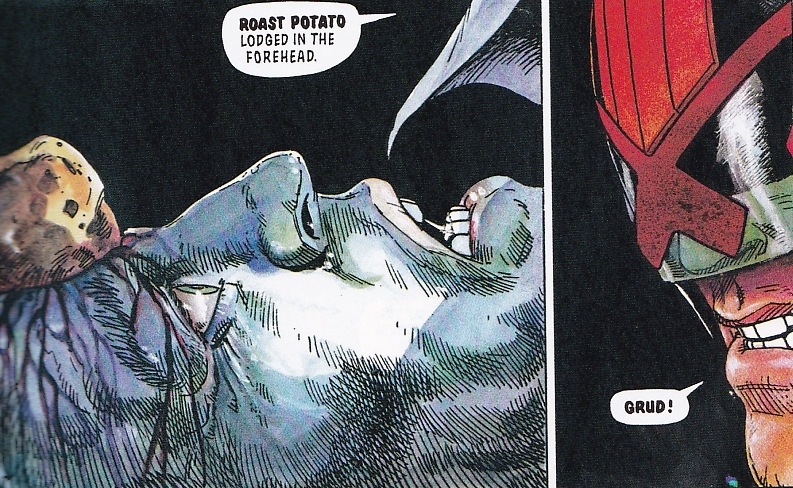 Depending if he has pupils in the comics, I would add them to the face, to round it off. Its takes ages to get right, to avoid them being too googly or off centre or staring or basically comical and detail like that is never seen in-game anyway, so I dont do it. 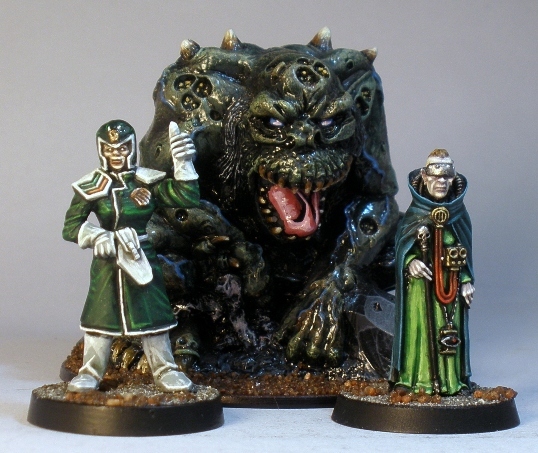 In an image of this size shown at miniature eye-level the rolled-eye look is more apparent than it would be on a wargame table in front of you. 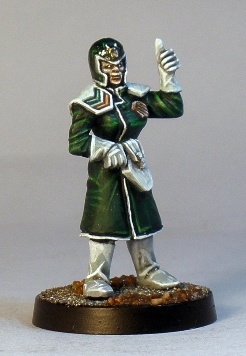 I did paint pupils on my miniatures for years, but unless the circumstances are exceptional, I dont do it any more. I do understand the desire to paint them in though, I just resist that desire now. Ok Sho3box, I finally arrived to visit after a long delay. Holy crap this is an awesome blog. My apologies for not arriving sooner. Great projects, great minis. Thanks for sharing all this stuff.